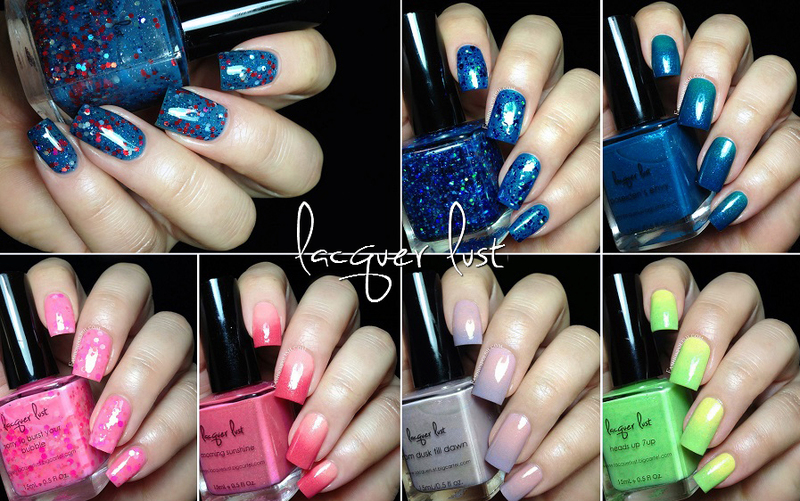 Fashion Polish: Lacquer Lust : more swatches & review! Lacquer Lust : more swatches & review! 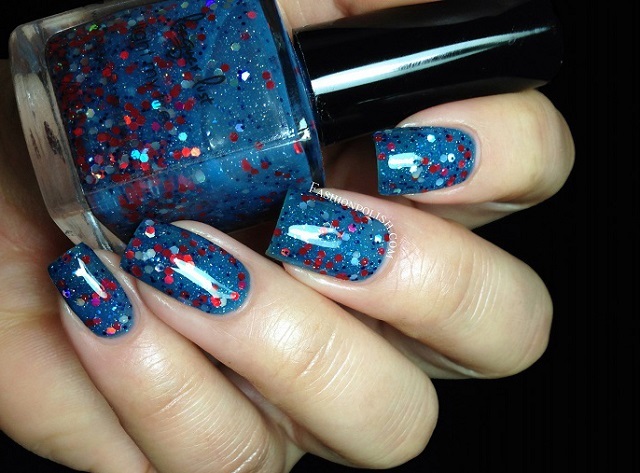 If you read my blog regularly then you're most definitely familiar with Lacquer Lust by now. Not only does the brand carry some of the best thermals of the entire indie world, they also have amazing shimmer, glitters and holos! (links to my previous reviews here). 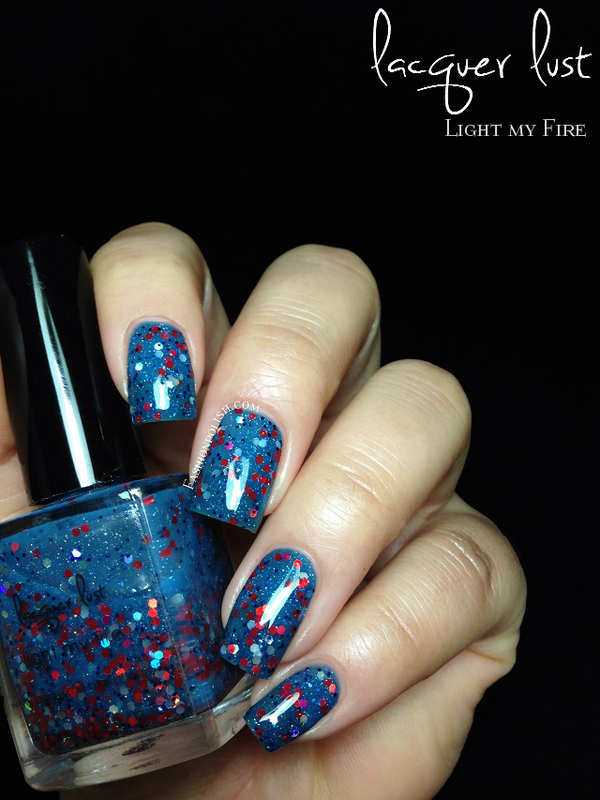 Light my Fire is (subtle) fading thermal medium blue jelly with a heavy mix of hex glitters in blue, holographic red/silver as well a whole bunch of micro holo particles. Truth be told, that didn't sound to me like the most appealing combination at first and despite some settling glitter / sheerness, once I my nails I forgot all about that and ended up loving it! I used 2 thin coats layered over Poseidon's Envy (cf. below) and formula was a dream to work with, not too thick or thin and with excellent glitter pay-off. Singing the Blueberry Blues is a blue and green glitter bomb with a nice blueberry scent. I'm not sure what the blueberry fragrance is supposed to smell like but this is deliciously sweet and not one bit overwhelming. Application and glitter coverage were also excellent and I used one good dabbed coat over Contrary Polish Surf in the swatches below. 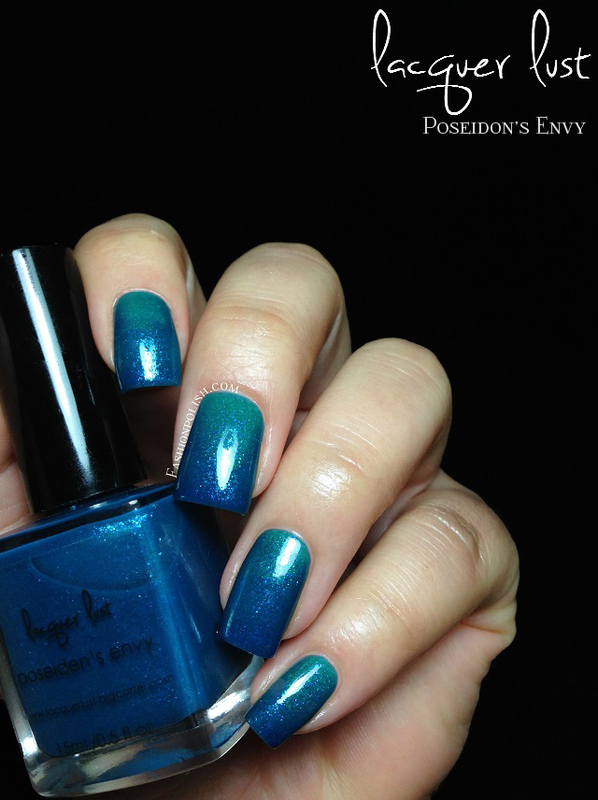 Poseidon’s Envy is medium blue jelly thermal with a blue/shimmer shimmer that transitions to a beautiful teal. I love this one and if you have a thing for blue or teal, you definitely need it! I used 3 thin coats for complete coverage. Sorry to Burst your Bubble is a sweet pink jelly loaded with white, fuchsia and iridescent glitters. 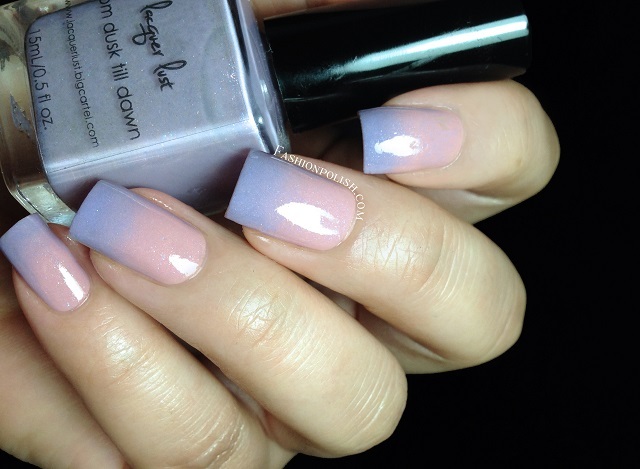 So pretty and delicate on the nails! I used 2 medium coats here to reach sufficient jelliesque coverage. 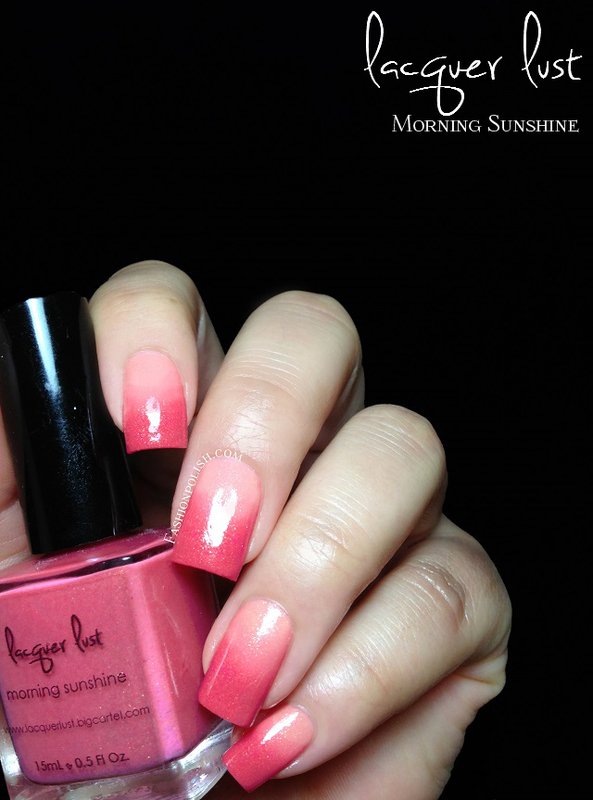 Morning Sunshine is a vivid pinkish coral with a strong gold shimmer and a clear fading thermal effect. I've been dying to try this one and it did not disappoint, so gorgeous! 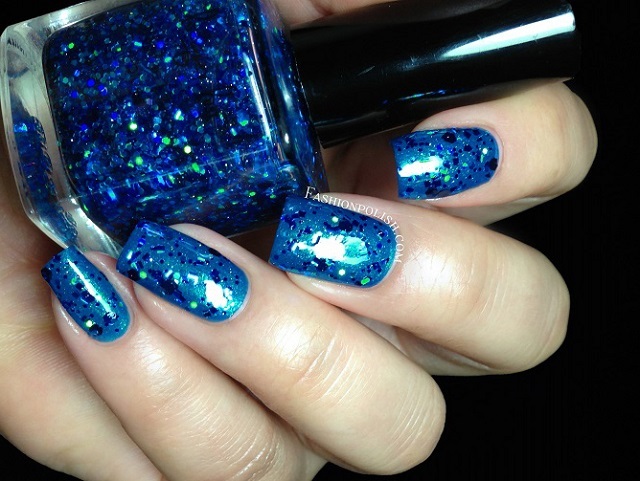 Easy application and a more pigmented formula here, 2 coats plus topcoat. From Dusk till Dawn is one of the most original thermals I have ever seen : dusty pastel lavender to warm peachy pink with a subtle pink and blue shimmer. I absolutely love it! Perfect formula and a 2 coats coverage here as well. 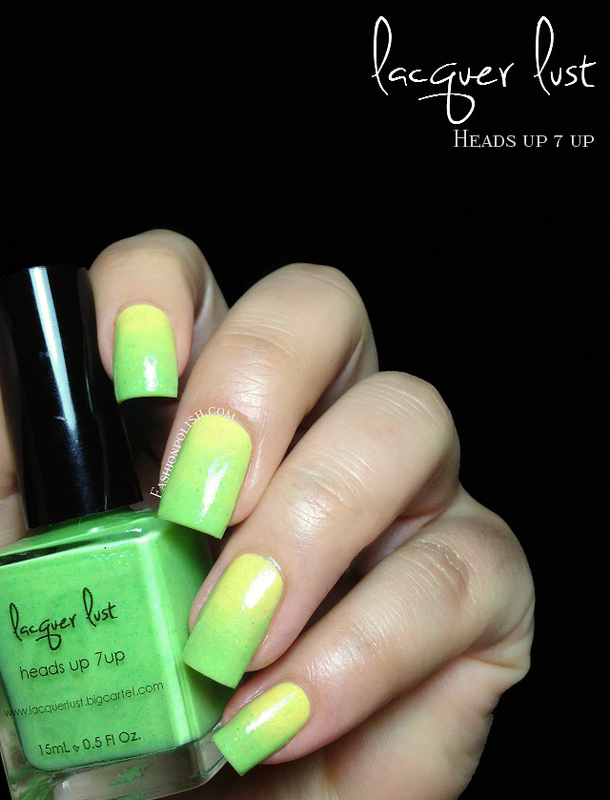 Heads up 7 up is a bold green to yellow thermal with gold/green shimmer. It's a super fun Summer color and I'd definitely see myself wearing it a lot on vacation. Also a 2 coater with easy application and very visible color change. I don't know about you but I'd have a really hard time picking a favorite here : the thermals were seriously amazing but I really didn't expect to be this wowed by the glitters, especially Light my Fire! 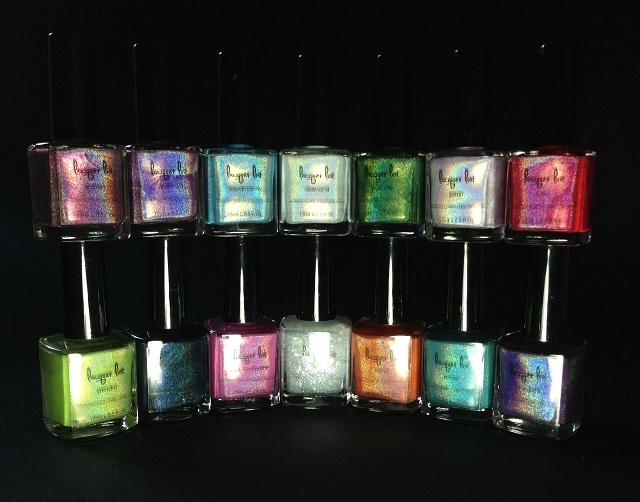 Lacquer Lust retails for $14.50 each and can be purchased directly from lacquerlust.bigcartel.com or through international stockists : Shoppe Eclecticco and harlow & co.